Back on August 17, I made a postÂ emphasizing the significance that anchor text has on your links. In this paid review, I want to show youÂ a great example of a new blog that put the power of anchor text to work for them. 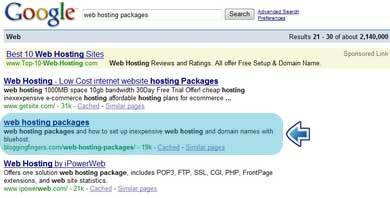 Matt Jones of BloggingFingers.com wanted to rank well for the search phrase “web hosting packages“. You may already know that anything to do with the word “host” or “hosting” will bring you a ton of competition. At first, I asked myself why he would even bother trying to rank well for such a competitive search term. However, after tracking his project since it began, I found some very encouraging results. In only three weeks, Matt has landed himself the 22nd spot in Google for his desired search term- oneÂ place above iPowerWeb! I’d like to see how much farther he can rank in another three weeks! How did he do it? Matt asked his readers to give him a hand by using the anchor text “web hosting packages” when linking to the page I just did in the beginning of this post. In return, he offers to link to two places on your site. First, he’ll link back to the page where you linked to him and secondly, he will link to your homepage. Obviously, a 2-1 link trade doesn’t sound like a bad offer, so some people hopped on board and helped him to rank where he does (very quickly, I might add). BloggingFingers.com offers some great blogging ideas, one of which is what Matt calls “niche blogging“- creating multiple smaller blogs in very tight nichesÂ to help set a foundationÂ forÂ your main blog by providing it with some “link juice”. That is pretty cool, does he have the total amount of links he gained from that promotion? I know that micfo is doing something similar with those contests that johncow is having. And micfo is placing really high too, but it seems like a lot of links. Hahaha, he is getting links to go to bluehost, that makes me laugh :c). What a great idea. It just goes to show that by thinking outside the box one can achieve things most people don’t believe possible. good on him for doing this. So when will this contest end and did I understand it correctly that everyone will get the 2 links? I was thinking of twisting the type of contest a bit but I think I’ll wait just a little bit longer so that I have a few more subscribers on my blog. I’m not sure exactly when his contest ends… you may want to check over on his site.